Bison forward #18 Michael St. Croix was named first star of the game after scoring this goal along with two others and an assist during during a February 2018 game against Lethbridge. 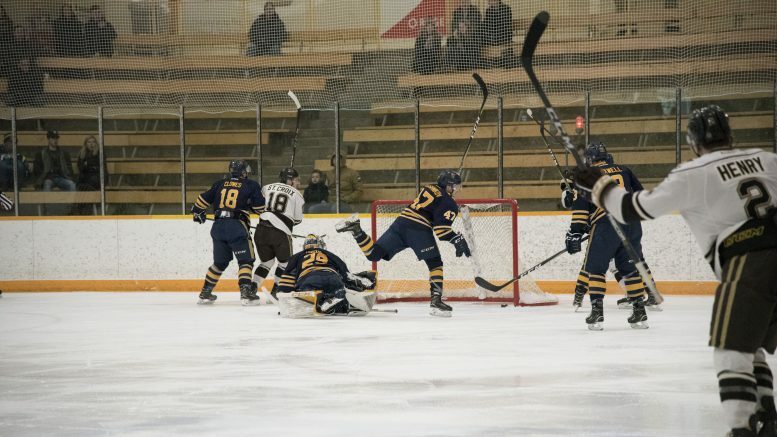 The University of Manitoba Bisons men’s hockey team extended its winning streak to five games with a two-game sweep of the University of Lethbridge Pronghorns this past weekend. 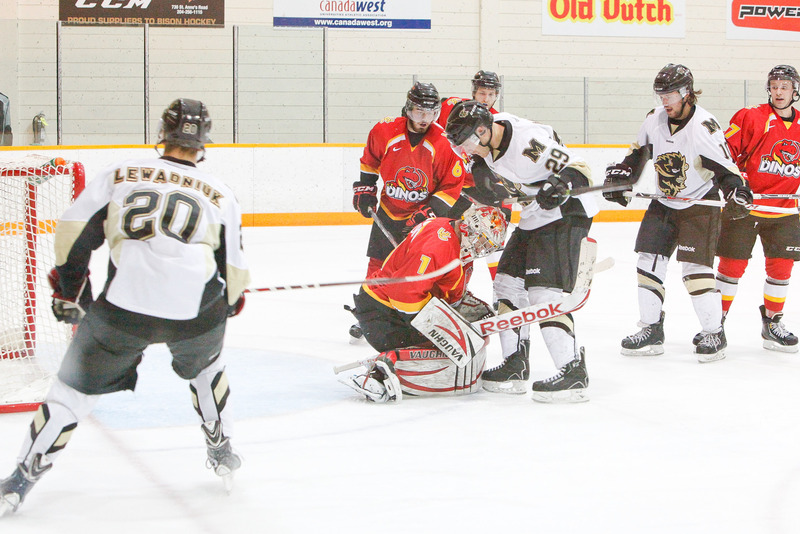 Manitoba won 5-4 on Friday night and followed up with a 7-3 win in the Saturday rematch. The Bisons have scored 27 goals in their last four games. With one weekend remaining in the season, the Bisons sit in third place in the Canada West with a 16-8-2 record. Manitoba heads to Calgary on Feb. 9-10 to play the University of Calgary Dinos, a potential first round playoff matchup. Manitoba got off to a hot start, with a flurry of chances to set the tone early. The home team was rewarded for their efforts at 3:46 when Quintin Lisoway roofed a shot over ‘Horns goalie Garret Hughson . Lethbridge battled back to tie the game a couple minutes later on the rush, with Brooks Maxwell going cross-ice to find Ryon Moser. Lethbridge took the lead through Maxwell a short few minutes later after he slotted home a pass from Russell Maxwell. The Pronghorns doubled their lead early in the second through Artsiom Kalashnikov, his first goal of the season. Towards the end of the period, it was as if the Bison goal song, Chelsea Dagger, was on repeat. Manitoba scored three unanswered goals in just 1:18 at the end of the period to carry a 4-3 lead after 40 minutes. Given a powerplay chance early in the third period Manitoba capitalized through Justin Augert, as he shelved it over Hughson to make it 5-3. Manitoba got into some penalty trouble later in the period. Blake Heinrich was called for a five-minute major and game misconduct, giving Lethbridge extended time with the man advantage. With Warren Callis off for tripping, Lethbridge pounced on the 5-on-3. Pronghorn defenceman Dallas Valentine had plenty of time and fired a hard shot over Byron Spriggs. Manitoba only allowed one goal on the extended Pronghorn powerplay, Sirant pointed to their strong penalty kill post-game. Moser was robbed of nabbing a second goal after Spriggs slid cross-crease to get the pad down halfway through the third stanza. Spriggs came up huge again late, making two kick saves to retain the Bison lead. Manitoba’s offence kept rolling Saturday afternoon – led by a Michael St. Croix hat trick – and put up seven on Pronghorns goalies Hughson and Ty Edmonds. Remi Laurencelle got Manitoba on the board first, but two minutes later Kalashnikov nabbed his second goal of the year to level the game. Tyler Hansen scored to give the Pronghorns a 2-1 lead three minutes later. In the second period, Manitoba scored three early unanswered goals to take a 4-2 lead. St. Croix got things started with his first, taking a feed from linemate Zach Franko. Liam Bilton added his seventh over a minute later and Lisoway scored exactly a minute later on the power play. The three-goal explosion prompted the end of the day for Hughson, who allowed four goals on 22 shots. St. Croix scored his second goal of the day two minutes into the third to make it 5-2 for the home team. Valentine got his second of the weekend a couple minutes later, but Brad Bowles restored the three goal lead a mere three minutes after Valentine’s marker. St. Croix got his third and team leading 12th goal with one second remaining, in the crease, Spriggs made 28 saves in the win.